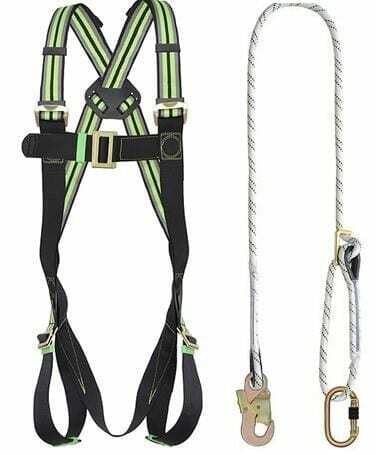 The safe, comfortable single point restraint harness kit available here at Rope Services Direct can keep you stable and secure while working at height. Comprised of a harness, rope lanyard and carry bag, it is a cost-effective option for safety-conscious people. The single point harness that comes with this kit has straps for the wearer’s shoulders and thighs which are colour coded to avoid a mix-up, as well as being fully adjustable to ensure a universal fit. A sit strap is also featured, giving support to the wearer’s posterior so that they are calm and comfortable during long periods of use. Meanwhile a dorsal attachment D-ring is affixed to the harness for the purposes of fall arrest, which provides peace of mind. The rope lanyard is two metres in length and 12mm in diameter, with special thimbles installed in the loops to resist abrasions and ensure it does not wear out too quickly. The sturdy steel snap hook makes it convenient to attach the lanyard to an anchor point and remove it when it is time to move. With a breaking strength of 22kN, the rope should withstand the kind of loads that most users will need it to bear. See our 2 point restraint kit for an even sturdier height safety option. Whether you have some queries about the height safety kit we sell, or would like a competitive quote for a restraint kit product, we are happy to oblige. Reach our team by calling 01384 78004 or emailing us online for all the information you need. Single Point Restraint Harness Kit Overall rating: 5 out of 5 based on 6 reviews.